One bright Sunday morning, Jill showed up at my Annapolis photo tour with a Pentax K1000, a vintage SLR. The camera is a classic for those of us who remember the film days. The last time I'd witnessed one was at B&H Photo Video behind a museum-like glass counter. I was getting excited about seeing one in use again when she told me it had one problem. The light meter didn't work. That means there was no way for Jill to look through the camera viewfinder and tell if her photo was going to be properly exposed. Without the instant feedback of a digital camera, she would never know what she had captured until she developed her photos. By then it would be too late to make adjustments. This problem is much easier to solve today than it was years ago. I just asked Jill to download a light meter app for her iPhone. With the app, she was able to measure light accurately and predict the correct shutter speed and aperture in any light condition. But what if she didn't have the app? The Sunny 16 Rule is an old school metering trick that Jill also could have used. 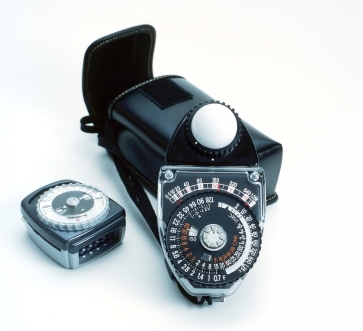 Photographers turned to this technique when they didn't have a light meter and needed to judge the correct exposure quickly. Here's how it works. On a sunny day, set your F-stop to f/16. Next, set your shutter speed to the fraction equivalent of your ISO. If you are shooting at ISO 100, then set your shutter speed to 1/100th of a second (or 1/125). What if your ISO is set to 200? Easy, set your shutter speed to 1/200th of a second (or 1/250). Using these settings should give you fairly accurate exposure. You don't have to be stuck with a broken meter to use these shortcuts. I meet many photographers who want to begin shooting in manual mode, but they aren't sure where to start. Rather than being intimidated, use the Sunny 16 Rule to make sure you have correct exposure. You can make adjustments from there. 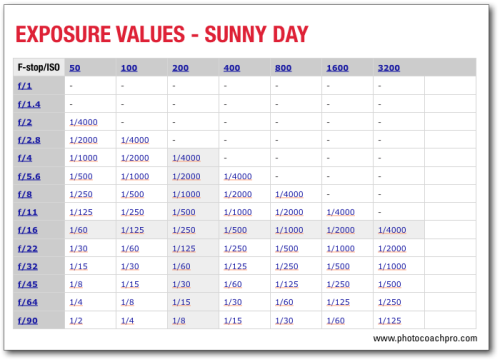 Use these guides to calculate exposure based on the Sunny 16 Rule.